Geonext is aJava-written interactive and free geometry software. It is developed by the Lehrstuhl für Mathematik und ihre Didaktik (Chair of mathematics and its didactics) of the University of Bayreuth in Germany and released under the GNU General Public License. Figure 1 - The Geonext Window. 1.) Click the New Board button. 2.) To draw a circle with center A and passing through B, click the Circle tool, click the drawing board to determine the center of the circle, then click another location to determine its radius. Notice that Geonext, automatically names the points in alphabetical order. 3.) 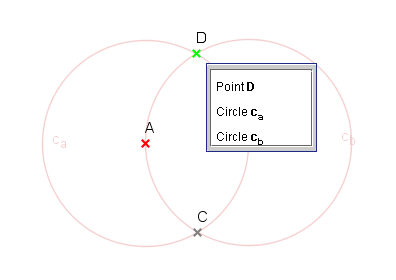 With the Circle tool still active, click point B and then click point A to create a circle, with center B passing through point A. 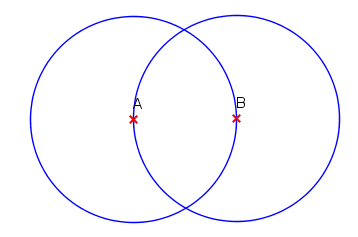 Figure 2 - Circles with centers A and B. 4.) Click the Point tool, and click one of the intersections of the two circles. Notice that a point D was also constructed. 5.) Next, we hide the circles and point D, leaving only points A, B and C on the drawing area. To hide the objects, click Objects menu from the menu bar, click Special Properties and click Hide. Click the two circles. Figure 3 - The circumference of the two circles are hidden. Notice, that hidden objects are colored pitch. The figure above is shown when you click point D. That means that Geonext is asking you which object to hide. A circle ca, cb or point D. Since both circles are already hidden, you just have to click point D. 6.) Next, we will use the Polygon tool to draw triangle ABC. To draw the triangle, click the Polygon tool, click point A, click point B, click point C and then click point A to close the triangle. Q1: Move the vertices of the triangle. What do you observe? 7. )Now, to verify that the triangle is equilateral, we can do two things: reveal the measure of the interior angles or the side lengths. To reveal the side length, click Texts and Calculations, then click Measure Distance, then click the three sides of the triangle. 8.) You can also measure the angles using the angle tool and using three points. For example, if you want to measure angle B, click the Objects menu, click Texts and Calculations, then click Measure Angle, then click point A, click point B and click point C.
9. Move the vertices of the triangle. What do you observe? Q2:. Explain why ABC is always an equilateral triangle. 10. Click the File menu and click Save if you want to save your file. There is also a similar construction here using GeoGebra.